PT Bank Negara Indonesia (Persero) Tbk - BNI (IDX:BBNI) or referred to as "Bank BNI" a is a reputable state-owned general banking company. Based in Jakarta. Bank BNI is majority owned by the Government of Indonesia Indonesia. To date, Bank BNI is 60% owned by the Government of Indonesia and 40% by public (8.3% domestic and 31.7% foreign). Bank BNI offers a full range of general banking products and services. Its products and services include personal banking, priority banking, business banking, international banking and treasury. As of December 2016, Bank BNI offer services through 17 regional offices, 196 domestic branch offices, 8 overseas branch offices, 948 sub branch offices, 623 cash offices, 96 mobile services, 17,056 ATMs throughout Indonesia. Bank BNI's overseas offices located Singapore, Hong Kong, Tokyo, Osaka, New York, London, Yangoon and Seoul. Bank BNI keeps growing with sustainable performance in the first half of 2017 (1H 2017, ended in 30 June 2017). Bank BNI succeeded to chalk up a total assets figure of Rp631,741 billion in 1H-2017, according to PT Bank Negara Indonesia (Persero) Tbk Analyst Meeting Financial Performance 1H-2017 as cited by JobsCDC.com. This total assets figures reflected an 17.2% increase from Rp539,140 billion in 1H 2016 period. Bank BNI’s total third party funds in 1H-2017 also surged as much as 18.5% when compared to the previous year’s, from Rp391,490 billion in 1H-2016 to Rp463,862 billion in 1H-2017. Bank BNI's net income as of June 2017 reached Rp6,413 billion, compared to Rp4,371 billion in June 2016. Education background in Senior High School (SMA)/equivalent up to Bachelor Degree (S1) who have no work experience. Minimum average score on 1st and 2nd semester of 12th grade of 7 for SMA/equivalent. Minimum GPA of 2.50 for Diploma up to Bachelor Degree (S1). Age is between 18 – 25 year old at the time of registration. Have a good health and not color blind as evidenced by notice letter of health condition from Doctor or Hospital. Have never been involved in drug / any other violation as evidenced by SKCK. Minimum height of 160 cm for Female and 170 cm for Male. JobsCDC.com now available on android device. Download now on Google Play here. Please be aware of recruitment fraud. The entire stage of this selection process is free of charge. 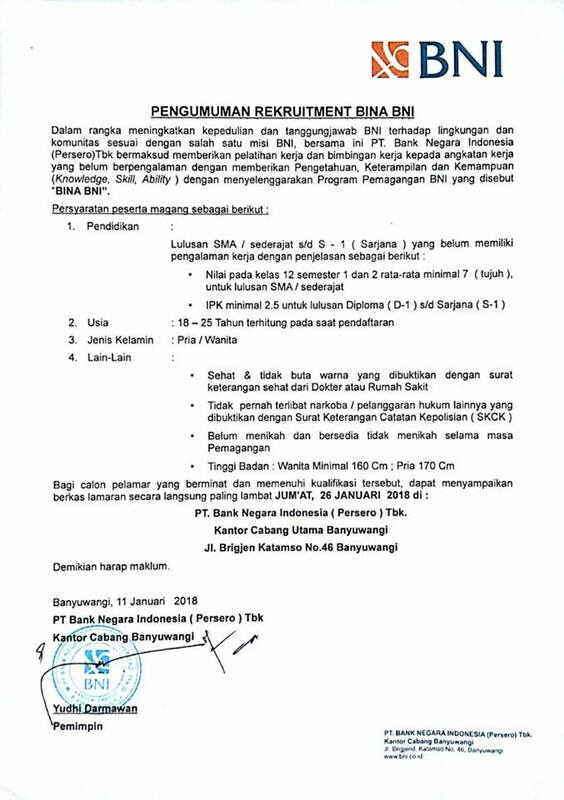 PT Bank Negara Indonesia (Persero) Tbk - Fresh Graduate BINA BNI Program Bank BNI January 2018 will never ask for fees or upfront payments for any purposes during the recruitment process such as transportation and accommodation.